This article needs to be updated with material from Field Manual: 3145, Historical: War of 3039, Historical: Wars of the Republic Era, Era Report: 3052, Era Report: 3062, Era Report: 3145, Jihad: Final Reckoning. Once this title clears the Moratorium period, or if it already has, please consider revisiting this article and updating it with the new material, removing this tag once all information has been added. The First Kearny Highlanders were the oldest and longest lived of the Northwind Highlanders formations. The regiment was originally formed by volunteers from the mining settlement of Kearny on Northwind. The unit fought early battles for various Great Houses, including the Capellan Confederation. Its career in these early times was checkered with victories and defeats. The unit's first notable conflict was during the 1st Andurien War, where the unit fought for the Confederation. The unit was nearly routed on Lopez by elements of House Marik's Oriente Hussars. This route nearly cost the unit its career. 2761 - 1st Kearny redeem themselves by successful occupation of the Davion world of Demeter with odds against them. 2801 - The unit is deployed to Lincoln to successfully defend the world from elements of House Kurita's Dieron Regulars attempt raid the world. 2802 - The unit fought and lost to elements of the DCMS on Lincoln, losing their command battle standard. The standard was presented back to the Highlanders as a gift of goodwill by Omi Kurita in 3058. 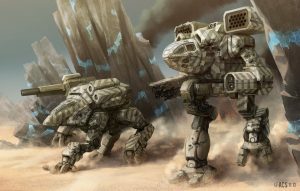 2865 - 1st Kearny returned to Northwind to defend the world from House Marik regulars and their mercenary support units. The 1st Kearny was able to drive off the invaders. They inflicted heavy damage on the fleeing units, including the mercenary force known as the Jal's Jaegers but lost half of its men and equipment in the effort. The unit resolved to rebuild itself with heavier equipment, so it restricted itself to raiding until it fully rebuilt. 2866 to 2880 - 1st Kearny conducts a number of raids on Free Worlds League holdings for 'Mechs and supplies. Recovering large quantity of medium class BattleMechs to allow the regiment to fully recover. 2943 - The 2nd Company of the 2nd Battalion, under the command of Captain Erika Laurel leader her company held the defense of world Hsien against Marik troops until the Warrior House Ijori regiment arrived. In the 3008 Battle of New Aragon, the First and Second Kearny Highlanders faced Wolf's Dragoons and successfully held off five different assaults, including one from Zeta Battalion. 3028 - Stationed on Highspire the 1st Kearny departed, after news reached them of the negotiation between the clan elders and the Federated Suns, to their new home on Northwind. This unit was the sole regiment from the famed Northwind Highlanders to remain in service after the founding of the Republic of the Sphere, the First Kearny spent a couple of decades as a garrison unit for the Northwind Military Academy before being reinvented as a roving troubleshooter force. At the Jihad ended, the First Kearny Highlanders were stationed on Northwind in Prefecture III of The Republic of the Sphere. The Northwind Highlanders leadership negotiated with Republic government, where they would broker a deal to join the Republic Armed Forces while preserving the Highlander's legacy. In the end the First Kearny was elected to remain intact, while rest of the regiment would eventually be absorbed into the RAF losing their identities as Highlanders. While rebuilding from Operation SCOUR in 3078, the First Kearny would end up detaching a battalion of it's forces to help rebuild the Third Republic Auxiliaries after the fighting during Operation: Golden Dawn. After the initial conflicts Republic had during 3090s, the First Kearny would remain on Northwind as a garrison for the Northwind Military Academy. After years assigned to this duty, the regiment would be reinvented and tasked themselves as a troubleshooting force. As independent unit, the Highlanders would end up not being utilized during the Capellan Crusades of 3112-3113. In August 3132 the late HPG Network was attacked, later known as Gray Monday. True to their mission, the First Kearny were deployed across Prefecture III aiding in putting down uprisings and newly arisen splinter groups trying to gain power for themselves. Under the direction of Prefecture III's Prefect Tara Campbell (daughter of a former Highlander commanding officer), she would reinforce and use the First Kearny as main means of striking trouble hotspots across her and other neighboring Prefectures in the course of the early years of the Black Out. The First Kearny along with two newly risen sister Regiments (Northwind Fusiliers and slightly later the Republic Guards) would end being spread thin across Rimward and Spinward portions of the Republic. Elements of the First Kearny would end up engaged in fighting an invasion of Northwind itself, by Steel Wolves, a Clan-oriented splinter group, twice. Over the course of nine months (first in June 3133 and in February 3134) with minimum resources, Campbell and the elements of the regiment would end up fighting off two take over attempts by the Steel Wolves and its uncanny leader, Galaxy Commander Anastasia Kerensky. Despite betrayal of Paladin Ezekiel Crow, the Highlanders succeeded, mounted what amounts to a counterattack to stop Steel Wolves from it's next destination, which would soon be found out as Terra. The First Kearny with the rest of the available Northwind Highlanders Tara Campbell could muster, end up fighting off Steel Wolves with the Tenth Principes Guards on the fields of former Nation-State of Russia in April. The regiment would continue to be stretched for a few more months until they would be requested to muster on Skye, where they would face threat of invasion by Clan Jade Falcon. They would need to dig in and help build clever strategies as they faced elements of multiple Galaxies of troops after the Clan had captured a number of Prefecture VIII and IX worlds. The regiment, along with other coalition forces (including Steel Wolves) would manage to repulse the Falcon's first invasion in August 3134, however they would be forced to withdraw from Skye failing to fight off the second attack. The only goal is victory at any cost. The company fields 12 Clan BattleMechs. The First Kearny Air Wing contains 6 elite fighters. The regiment contains a vehicle company. The entire unit contains 85% upgrades. The unit are elite special forces. The unit now contains full compliment of battle armor. CO: Colonel Robert Ballantrae \ XO: Lt. Colonel Carole McMasters. Note: The Regiment's Equipment Rating is listed as having access to "B" level tech/equipment. ↑ 3.0 3.1 3.2 3.3 Era Digest: Dark Age, p. 15, "FIRST KEARNY HIGHLANDERS"
↑ Field Manual: 3145, p. 183 Independent Units - 1st Kearny survival and Some details of 1st Kearny's actions during the early days it serving the Republic of the Sphere. ↑ Historical: Wars of the Republic Era, pp. 86-87 Capellan Crusades Deployment Tables - "Northwind Highlanders are not listed as being deployed as part of the conflict. ↑ Era Digest: Dark Age, pp. 15-16 First Kearny Highlanders - "Brief profile gives a basic early history of the First Kearny as garrison unit for the academy and later as troubleshooting unit its later years. ↑ Era Digest: Dark Age, p. 10 Dark Age Timeline - Gray Monday / HPG Crash listed. ↑ Era Digest: Dark Age, pp. 8-10,15-16 - Brief highlights of the combat for Northwind, Terra, and Skye noted. ↑ Field Manual: 3145, p. 14-15 Descend - Campbell and Highlanders effort noted and more details of the Battle for Skye. ↑ 12.0 12.1 Field Manual: 3085, p. 186, "RAF Deployment Table - 3085"
↑ MechWarrior: Dark Age - Dossiers and Pilot Cards, p. 10, "Caden Senn profile"
This page was last edited on 16 March 2019, at 18:03.